Seen here in the protected waters of Matia Island, IRONBLOOD slips along easily under oar power. 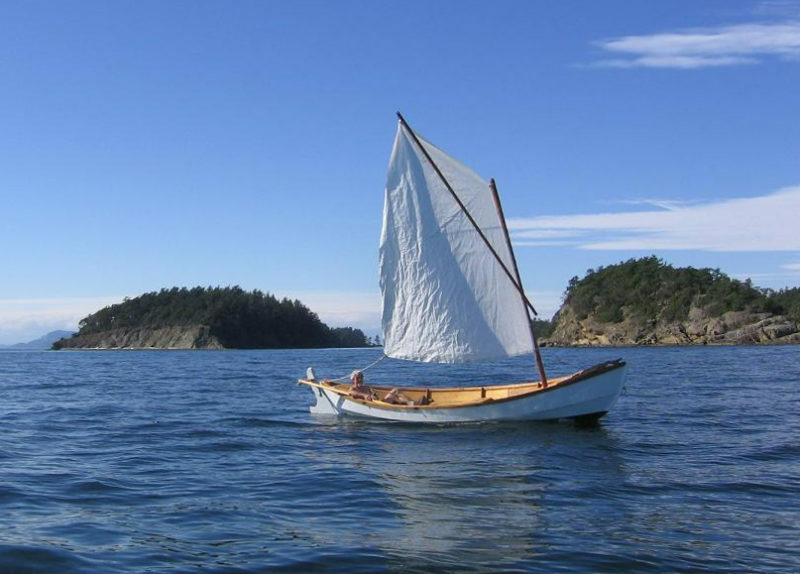 “After moving ashore from my first schooner, and having acquired a wife and a small son,” writes Michael Colfer of Bellingham, Washington, “I realized I needed a smaller boat.” He started his search for a boat appropriate to his new life by building a Nutshell pram. It proved too small, so he next built Pete Culler’s Good Little Skiff. Christened SHAMROCK and rigged with a spritsail, it served well for cruising the San Juan Islands and camping ashore on state park campgrounds, but while the skiff did well sailing the protected waters within the archipelago, Michael wanted a boat capable of taking on some more challenging weather in the more exposed areas around the archipelago. The augmented keel and skeg improve upon the faering’s sailing abilities without obstructing the boat’s interior with a centerboard trunk. In his search for a more seaworthy beach cruiser capable of carrying more gear, Michael found his way to faerings and variations on the theme by Joel White (16′ Shearwater), Iain Oughtred (14′ 11″ Elf and others), and John Atkins (18′ 7” Valgerda). All three of these designs were inspired by Hardanger faerings of southwest Norway and had similar shapes below the waterline. Michael built two boats to his design: IRONBLOOD (at the end of the dock) for himself, and a then unnamed faering for his son. The plan was for the two to sail and row the Inside Passage, but family obligations took precedent. After sea trials, the second faering was sold. 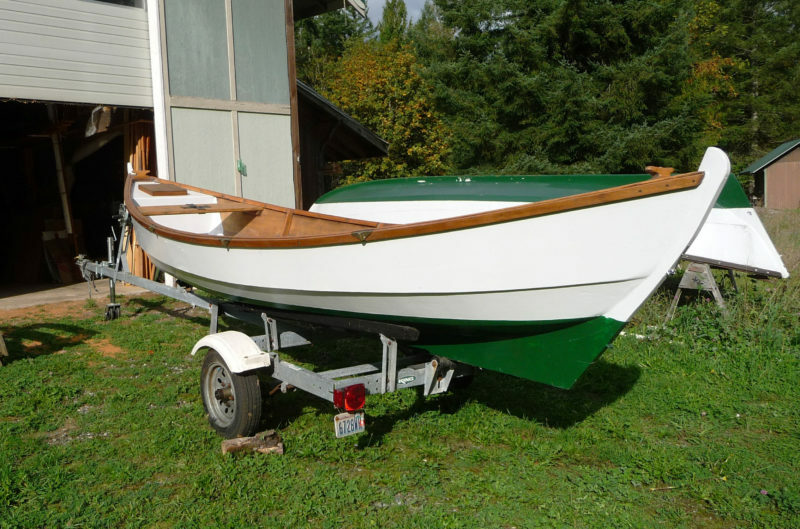 Michael bought plans for the Shearwater and although White’s dimensions and drawings make it possible to build without lofting, he lofted the lines and began making some modifications that would make the boat well suited to all Puget Sound waters. He added freeboard throughout and extra height to the ends to provide a dry ride in steep chop. To keep these modifications from increasing the width along the sheerline, he made the sheerstrakes closer to vertical. His changes brought the length to 17′ 3″. Easily removable thwarts and broad floorboards provide room enough for bedding down at anchor. He wanted to improve upon the boat’s sailing abilities but didn’t want a centerboard trunk cluttering up the boat’s interior, so his keel is deeper than that of the Shearwater, adding only a little at the bow and increasing the depth to 7″ at the stern for additional lateral resistance. The change was also meant to protect the rudder, making its removal unnecessary when landing on beaches. IRONBLOOD is quite at home in the San Juan Islands, both in the quiet coves and in the passes that funnel tides and winds. Michael added storage compartments fore and aft for dry storage of his cruising gear. The aft compartment has a sloped bulkhead to make a comfortable backrest when taking the helm while sitting in the bottom of the boat. The three removable rowing thwarts clear the interior for a night spent aboard at anchor. The floorboards provide a flat, level platform for sleeping. The loose-footed sprit sail makes sailing about as simple as it gets. Light summer breezes make for unhurried passages between islands. Michael christened his faering IRONBLOOD, drawing upon the meanings of his surname, Colfer: col is a Gaelic word for blood, as in blood relative, and fer is the French for iron. IRONBLOOD would be at home in the fjords of Norway, but sails the waters of Puget Sound. 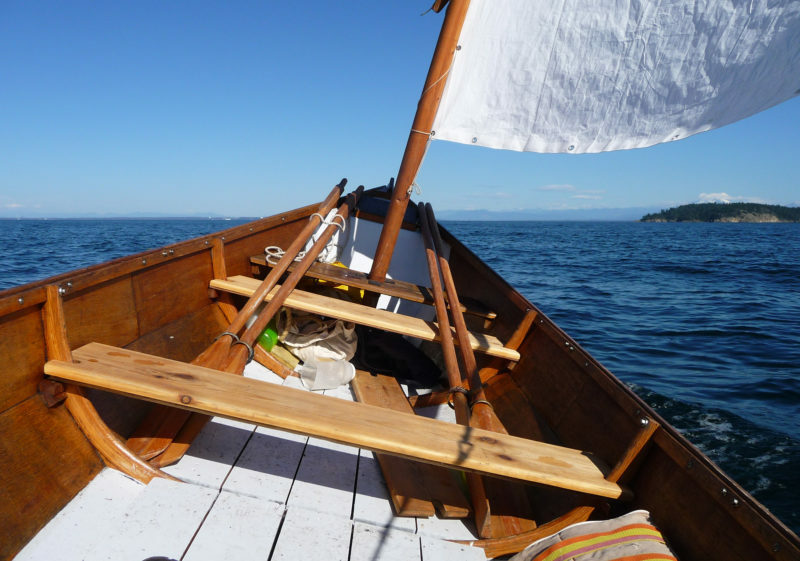 She can carry enough gear for a week’s beach camping for two, makes way under oars well, and is stable and smooth under sail, making very little leeway. Waters along the northern perimeter of the San Juan archipelago can get quite choppy—winds from the north and northwest have 15 nautical miles of fetch. The higher ends and freeboard keep the going drier. Here IRONWOOD is bound for Matia Island. Michael says that IRONBLOOD “will run like a scared rabbit for hours at a time given the right conditions.” The increased height at her ends keeps her dry in a chop as he intended. Where can I purchase plans for IRONBLOOD? Michael, there are no plans for IRONBLOOD per se. 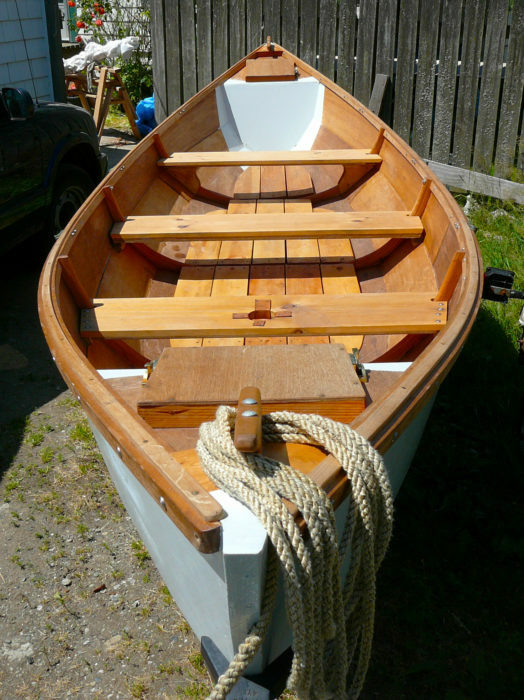 But, buy a set of plans for Shearwater from WoodenBoat for $75. Raise the freeboard by a fraction and the ends as you can see in these photos. From the stem run a straight keel to 7″ depth at what is now the rudder post. I put a stainless-steel strip on the bottom of the keel, and I fiberglassed the bottom panel. Other than that, the only difference from Joel White’s plan is to use a spritsail instead of the lug. It is a hell-for-leather boat. Great article. I enjoyed reading this as it gives me—a complete newbie to sailing and boatbuilding—a good feeling about size and shape in different conditions. Glad you liked it, Alex. This is an excellent family boat—stable and safe. I love her, as you can tell from the article. Michael, thank you for sharing your creative genius. Your boat looks pretty darn good. 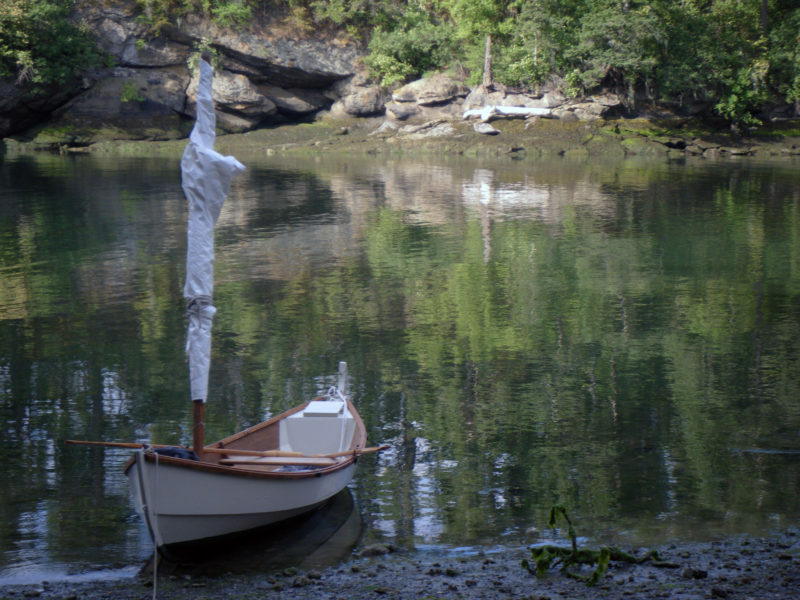 My wife and I are consummate rowers and I am always looking for good pulling boats for island-hopping camping trips here in the Penobscot Bay in Maine. Right now we row an 18′ Chamberlain gunning dory. 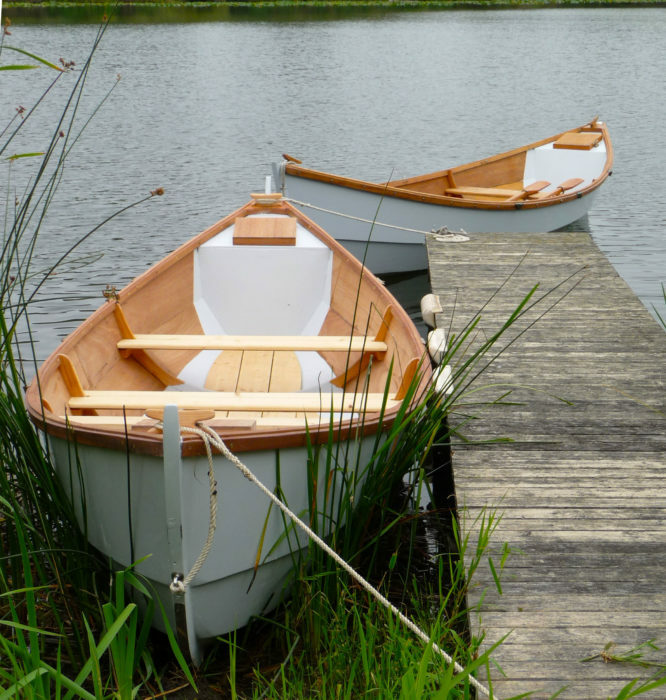 She’s seaworthy and roomy but we wouldn’t mind a bit more speed under oars. How does IRONBLOOD feel rowing? I notice you say, “…makes way under oars well.” Could you elaborate? Thanks, Wes. For simply rowing, I leave lots of gear at home. The mast, sprit, sail, rudder, and tiller are fairly hefty, and I can really feel the difference. The really nice part of rowing tandem in IRONBLOOD is that, at 17′, the distance between forward rowing station and aft rowing station are enough that oars never collide, even when the strokes get out of whack. I have only rowed tandem a few times in IRONBLOOD, but those times have been very pleasant. Once, my son and I rowed against wind and tide in Puget Sound for a distance of some two or three miles, against a severe chop over shallow water. IRONBLOOD would lift her bows nearly clear of the water, and there would be spray out both sides, but not into, the boat. It was pretty wild, and Greg and I found ourselves yelling in glee, like a couple of banshees. We still made very good time over the bottom. In calm waters the boat moves very, very easily. She is heavy for a rowboat, but in waters like Puget Sound, where tidal rips happen a lot, and where the chop gets heavy, that weight is a distinct advantage. 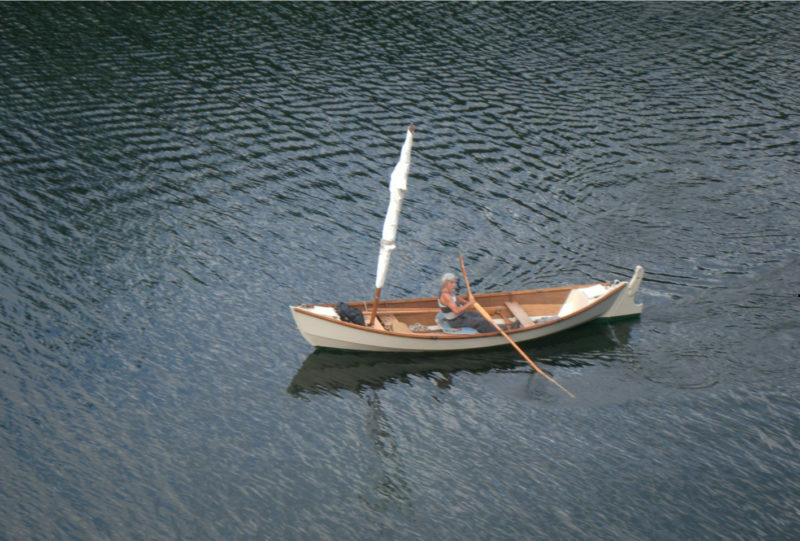 You should go over to WoodenBoat and row a Shearwater, for it is essentially the same boat. I am pretty sure Woodenboat has one there at their dock. Bear in mind, though, that I made mine higher, especially in the ends, included gear lockers at both ends, and my floorboards are 3/4″ pine, so IRONBLOOD is a good deal heavier than the standard Shearwater. And finally, the only way to get an IRONBLOOD is to build her yourself.